Chinese soldiers trying to enter Damansky Island in the USSR during the 1969 Soviet-Chinese border conflict. Although China is now regarded as one of Russia’s key strategic partners, the two countries have not always lived in peace with one another. The conflict over the Chinese Eastern Railway (CER) could be considered a border-related one. The route itself and the area around it, according to the 1924 agreement between Soviet Russia and China, was considered joint property. The road even had its own flag, "compiled" from the Chinese five-coloured flag at the top and the Soviet red flag at the bottom. The conflict was explained in the West by stating that the Chinese did not like that in the second half of the 1920s, the CER saw declining profits and became unprofitable because of Soviet Russia’s position. In the USSR, the causes for conflict were explained by stating that Zhang Xueliang, the ruler of Manchuria (through whose territory the CER ran and which, at the time, was de facto independent from China), egged on by the "Western imperialists" and by the White Russians settled on the border Chinese-Manchurian cities, thirsting to check how strong the Red Army was. Traditionally, the Chinese army was much larger during the Russian-Chinese military conflicts. The Manchus put up more than 300,000 soldiers to fight against Soviet Russia, while only 16,000 Russian soldiers took part in the fighting. However, the Soviets were better armed and actively used airplanes, giving them an edge. As a result of an air attack on 12 October 1929, five of 11 Chinese ships were destroyed, and the rest retreated upstream. After that, troops landed from the ships of the Far Eastern military flotilla. With the support of the Red Army, the artillery captured the Chinese city of Lahasusu. 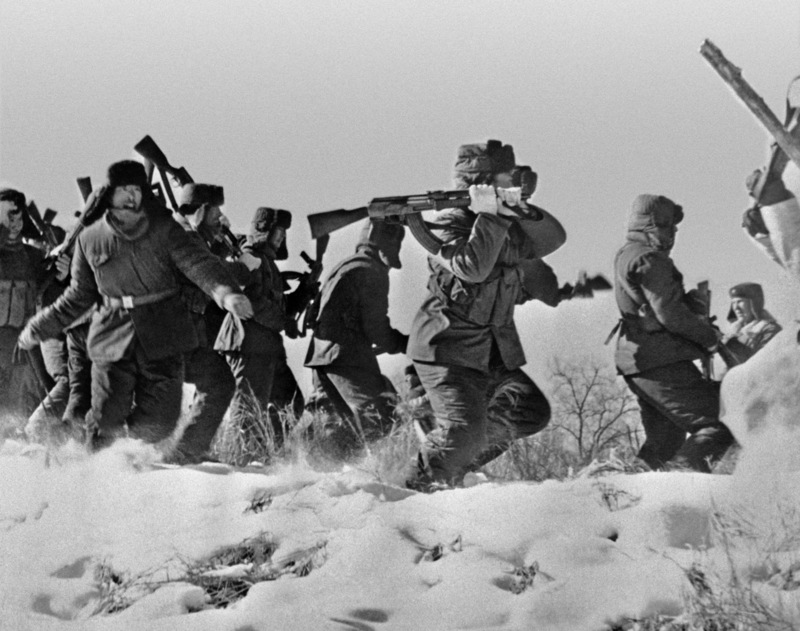 Soviet troops, having defeated the enemy, soon retreated into Soviet territory. The same happened during the Fugdinskaya operation which began on October 30, 1929. At the Songhua River estuary, eight ships from the Far Eastern Military Flotilla with troops on board finished off the Chinese Sungari Flotilla stationed here. Then two regiments of the 2nd Infantry Division occupied the city of Fujin and held on to it until November 2, 1929, before returning to Soviet territory. The military action, which continued until November 19, convinced the enemy of the moral and military-technical superiority of the Soviet troops. According to some estimates, the Chinese lost nearly two thousand people in the course of fighting, while more than 8,000 people were wounded. The Red Army’s losses amounted to 281 people. Characteristically, the Soviet side showed great humanity with the captives, reassuring them that "the Russians and the Chinese were brothers forever." More than a thousand prisoners stayed on in the Soviet Union. The Manchurian side quickly sought peace and, on December 22, 1929, an agreement was signed, according to which the CER continued to be jointly used by the USSR and China on the same terms. This was not the largest in the series of the Russian-Chinese clashes but, perhaps, the most significant in terms of its historical and geopolitical consequences. Never before had the two major world powers stood so close to a full-scale war, the consequences of which could have been catastrophic for both sides. In the battle for the Sino-Soviet border, 58 Soviet guards were killed and, according to various estimates, between 500 and 3,000 Chinese soldiers (the information is still kept secret by the Chinese side). However, as has often happened in Russian history, what they managed to attain by force of arms was surrendered by diplomats. As early as the autumn of 1969, negotiations were held, as a result of which it was decided that the Chinese and Soviet border guards would remain on the banks of the Ussuri, without entering the Damanskii island. In fact, it involved the transfer of the island to China. Legally, the island was passed over to the PRC in 1991. A few months after the conflict on the Sino-Soviet border, the Chinese again (the last time then) tried by force to test the "northern neighbour" for strength. On August 13, 1969 at 5.30 am, 150 Chinese troops invaded Soviet territory in the area of the Kazakh Zhalanashkol Lake. The Soviet border guards tried to avoid hostilities and enter into negotiations until the last moment. The Chinese did not react. They took up defensive positions on the hill stone and began to dig. The border guards at the "Rodnikovaya" and "Zhalanashkol" outposts attacked the hill, supported by five armoured personnel carriers. Within hours, the height was freed of Chinese personnel and the attack repulsed. Two Soviet guards were killed. The Chinese lost 19 people. Less than a month after the conflict, on September 11, 1969 in Beijing, Alexei Kosygin and Zhou En lai agreed on measures to stop the clashes on the Russian-Chinese border. Since then, tensions in bilateral relations between the two countries began to decline. The length of the Russia-China border today is 4209.3 kilometres, with a land border and a riverine boundary. There is however, no sea boundary. The article is abridged. Read the full version published in Russian by Russkaya Semyorka.